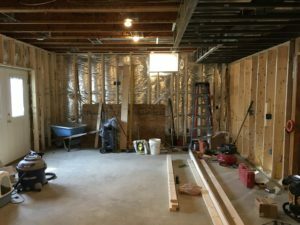 This project started with pretty bare bones: an unfinished basement with much to gain. The vision for the space was a place for both adults and children to entertain and be entertained while keeping it neutral with pops of color. We started with the finishes: black cabinets were paired with a warm golden granite with flecks of black along with warm wood floors with darker edges. The walls were painted a khaki color to keep it neutral and accentuate the molding detail. The large, open floor plan was divided into two priorities, a TV area and the kitchen area which consisted of a long room. The area by the kitchen/bar was the perfect place for the “adult” area making room for a game area on the other end. 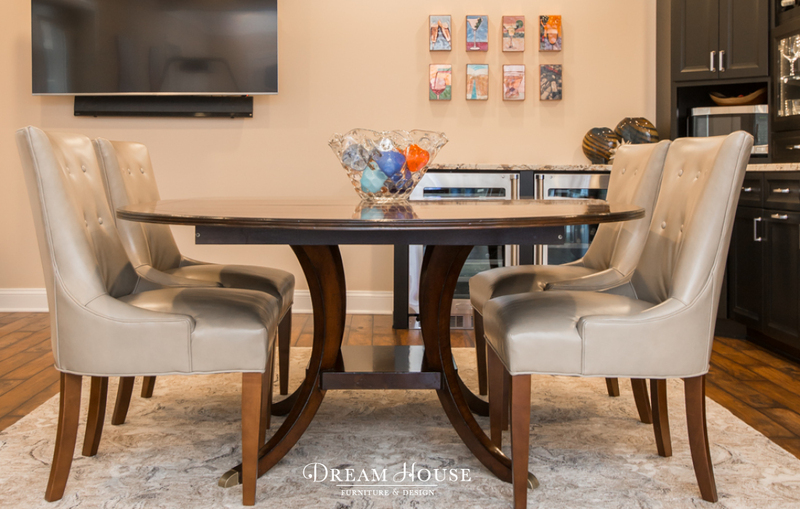 We chose a beautiful, warm wood extending dining table (Woodbridge Furniture) to complement the floors and counters and keep the space cozy and inviting. It’s the perfect place to host and congregate (everyone loves being by the kitchen). The rug (Company C) helped to brighten the floors and pulled in colors from the countertop and backsplash to create a layering effect of light and dark pieces. We picked a smooth, soft leather for the chairs (CR Laine) to make the area feel more sophisticated and to add another texture to the lush surroundings. As most projects are done in phases, phase two was accessorizing! (Global Views) We pulled navy into the second half of the long kitchen area on stools for a high top table game area as well as art in the adjoining TV room. Using blues and small pops of orange, we carried some color into the kitchen while keeping the accessories to a minimum to let the architecture shine. The fun series of tiles (Houston Llew Spiritiles) with drink themes on the wall over the beverage refrigerators was a fun personalized touch that added color and character. Mixing comfort and style into a basement design proved to be so rewarding! This basement is now the highlight of the home and has become an enjoyable space catered to the family’s needs for all ages to relax, play, and entertain.